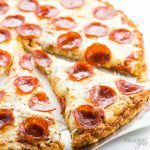 An EASY low carb keto Fathead pizza crust recipe with coconut flour OR almond flour. Just 4 INGREDIENTS! Fathead pizza is the ultimate keto pizza - crispy, chewy, and ready in 20 minutes. After you confirm, you'll receive a link to the Members Area where you can download the printable! 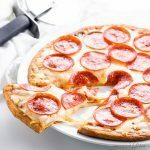 FREE PRINTABLE - FATHEAD PIZZA CRUST 3 WAYS! 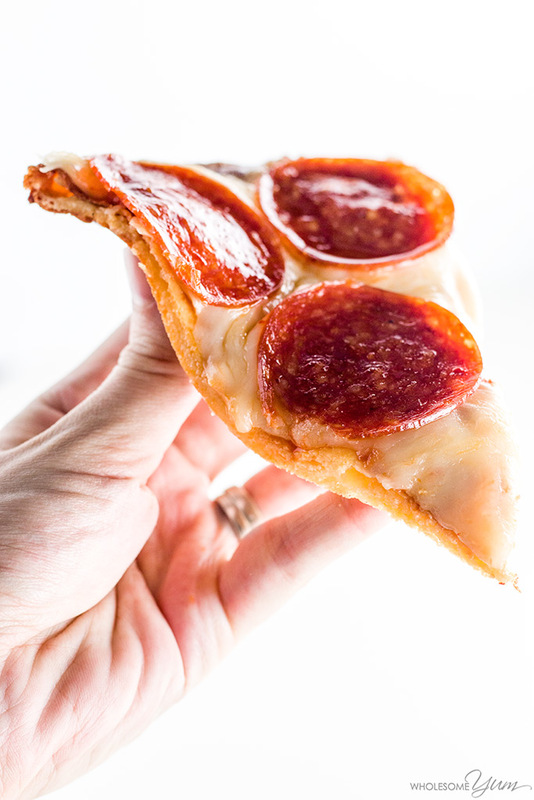 Join 100,000+ subscribers to get a FREE printable including 3 WAYS to make Fathead pizza crust. Plus, get a free ebook & NEW recipes 3x/week! Have you ever tried low carb keto Fathead pizza crust? You guys, it’s unbelievably similar to “real” pizza dough made with wheat! When you try this fathead pizza recipe, I challenge you to notice that it’s gluten-free and keto pizza. You can barely tell! 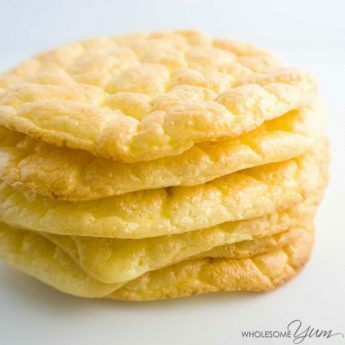 It even has that chewy quality that’s so difficult to achieve with low carb baked goods. I have to admit, I was pretty excited the first time I tried this low carb pizza. I’ve been making my other 4-ingredient low carb pizza crust with almond flour for over a year now. It’s on regular rotation at our house and we love it. Then there’s cauliflower pizza crust, which is great way to sneak in veggies. But I’ve gotten several requests for a nut-free version of a keto pizza crust recipe that tastes like the real thing. And here it is. Fathead pizza dough is a gluten-free, low carb and keto dough that is made with mozzarella, cream cheese, egg, and some type of low carb flour. There’s a reason fathead pizza crust is such a staple for a keto diet plan. It’s super easy to make, and the best part is that the texture is very close to real pizza! 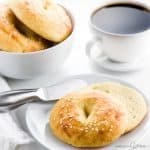 I also like to use fathead pizza dough to make low carb bagels and other baked goods. Fathead pizza crust nutrition content is very low in carbs, so it’s great for keto diets. How many carbs in fathead pizza? For both versions, this is nutrition info above is per slice of crust (1/8 of the keto pizza), without toppings. Toppings would be extra, depending on what you add. 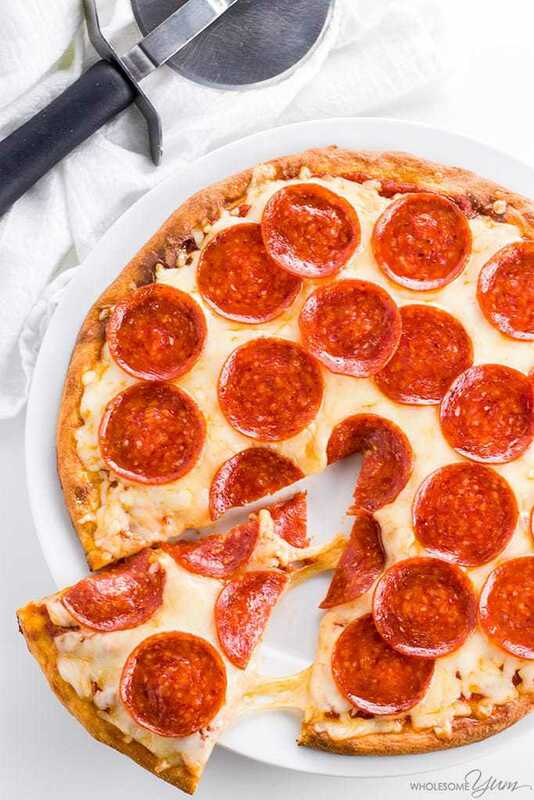 Even though this keto pizza crust is a little on the high side when it comes to calories, but you’ll be surprised at how filling it is. Most people agree it’s well worth it, and you end up eating less, too. The original recipe for low carb pizza from the Fathead movie contains almond flour. The classic combination of mozzarella and cream cheese to create a chewy texture. I thought it would be a perfect candidate to adapt into a nut-free keto pizza crust recipe. If you haven’t heard of the Fathead movie, it’s a 2009 documentary seeking to refute the lipid hypothesis. The lipid hypothesis is the claimed link between high cholesterol and heart disease. It’s basically the source of the “low fat” way of eating promoted in the Western world since the 1950s. Although numerous studies have debunked the link (this is a good scientific paper on the subject citing many sources), the belief is still widespread today and perpetuated by mainstream media. In the documentary, Tom Naughton sticks to a moderately low carb diet of fast food for 30 days. To the surprise of many, Tom not only loses weight but also ends up with lower blood cholesterol levels. And thanks to the film, we have the amazing keto Fathead pizza recipe as a result! This nut-free Fathead pizza crust recipe is my adaptation, made with coconut flour. Since coconut flour is so absorbent, you need a lot less of it to replace the almond flour. I used 1/3 cup coconut flour as a substitute, and also added an extra egg to impart additional moisture. I omitted the salt from the original recipe, because the cheeses are salty enough as is. Melt the cheeses together. You can melt the mozzarella and cream cheese together in the microwave, or a double boiler on the stove. Form the dough with the flour and egg. It’s important for the fathead pizza dough to be uniform. You can use a food processor, which I find easiest, or knead with your hands and squeeze through your fingers until it’s uniform. Bake the fathead pizza. Once you have the dough, roll it out or form it into a crust, and bake. If the dough is too sticky, check the tips below on how to deal with this. The difference is in the amount of flour and eggs. I’ve also tried making this keto pizza crust with flax seed meal, and that works too. It’s a great option for people with allergies! The taste of Fathead pizza is very similar no matter which flour you use. Some people are sensitive to the taste of coconut flour, but personally, I can’t taste it at all in this recipe. The cheese masks it really well. Pretty much the same goes for the almond flour and flax seed meal. Kneading with your hands is the trick to making Fathead pizza dough blend well in the third step of the recipe. Especially when working with coconut flour, the mixture dries and solidifies quickly. Just keep using your hands to squeeze and knead until the dough is uniform. You can always reheat a little to soften the cheese again, but don’t overdo it, to avoid cooking the eggs. Another option to make the Fathead pizza dough come together more easily would be to use a food processor. Just fit it with the dough blade, or even simply an S knife blade, and have it do all the work for you! You may need to scrape down the sides a little to get the dough to form in a food processor. Also, if it doesn’t want to mix together, positioning the cheese near the blade can help. Chilling the dough in the fridge will work wonders to make it more manageable. A good amount of chill time is 20 to 30 minutes. Use oiled hands to work with the fathead dough. This will help avoid sticking to your fingers. If the cheese solidifies too quickly, you may need to reheat a little to soften it, then try kneading again. The oven time for this Fathead pizza crust will vary depending on how thinly you roll (or spread) it out. I did find that it cooks a bit more quickly than the original. I like my low carb pizza crust very thin, so it only took about eight minutes for mine, but you can adjust the thickness to your liking. Just watch it in the oven, and poke more holes in the top if it starts to bubble up. What Does Fathead Pizza Taste Like? No matter which version I make (and I do them all! ), people tend to ask me if it’s just a regular homemade pizza crust. Yes, there is a slight difference, but it’s very close. This Fathead pizza recipe tastes pretty much like regular pizza! And the texture is spot-on, which is one of the most challenging things to get right with low carb dough. 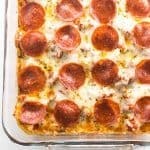 What Kind of Sauce To Use For Keto Pizza? This is a common question I get about keto pizza crust! I usually buy natural, organic marinara sauce with no sugar added. TIP: Watch for added sugar in the ingredients when buying marinara. I also have a homemade keto pizza sauce recipe coming up, so stay tuned for that. 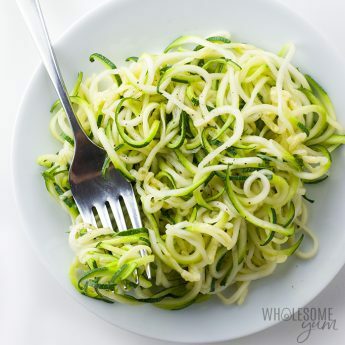 Low carb keto Alfredo sauce – I’m a huge fan of white pizza, and white sauce is lower in carbs than tomato sauce! Sugar-free BBQ Sauce – Barbecue chicken pizza is delicious! But, you have to use a sugar-free barbecue sauce to keep it keto. Macadamia Nut Pesto Sauce – This makes the fathead pizza taste more like a flatbread. You can use almost any kind of toppings for fathead pizza! Most pizza toppings are naturally low carb, since they are mostly meat and veggies. 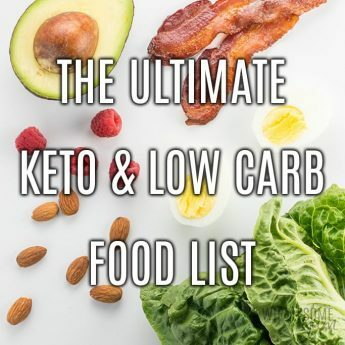 Get the full keto food list here for ideas. But, watch for ones higher in sugar, like pineapple. Can You Make This Fathead Pizza Recipe Ahead? Make the ball of fathead pizza dough ahead. You can store the prepared dough in the fridge for up to a week, until you are ready to use it. Bake the crust ahead. You can refrigerate it for up to a week. Add toppings and bake whenever you’re ready. Freeze fathead pizza crust or dough. See options for that below! Can Fathead Pizza Dough Be Frozen? Make the dough, form a ball, wrap tightly in plastic, and freeze it. When you want to use it, let it thaw completely and then roll out as needed. You’ll have to bake the crust before adding toppings and baking again. Pre-bake the keto fathead pizza crust. I prefer this option for convenience – no thawing needed! Bake the crust as directed, wrap it, and store in the freezer. When you are ready to enjoy the pizza, simply add sauce and toppings to the frozen crust, and bake for about 20 minutes at 400 degrees, until hot. Food processor – A food processor can make fathead dough so much easier! Avoids the mess of kneading by hand. Double boiler – An alternative for melting the cheeses, if you don’t want to use the microwave. Rolling pin – Though you can use your hands, you’ll get the most even cooking if you roll out your keto pizza crust. And if you like it thin and crispy, this is a must! Pizza pan – You can cook the crust on a basic pizza pan, but this one has a perforated surface to help the crust crisp up. Place parchment paper over it to prevent sticking. Pizza stone and pizza peel – A pizza stone creates a crispier exterior to the crust. For a fathead pizza recipe, you’ll still want to use parchment paper on top, so it won’t stick. The pizza peel allows you to place the crust onto the stone and remove when it’s done. Preheat the oven to 425 degrees F (218 degrees C). 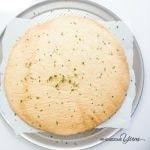 Line a baking sheet or pizza pan with parchment paper. Stir in the beaten eggs and coconut flour. Knead with your hands until a dough forms. If the dough becomes hard before fully mixed, you can microwave for 10-15 seconds to soften it. Spread the dough onto the lined baking pan to 1/4" or 1/3" thickness, using your hands or a rolling pin over a piece of parchment (the rolling pin works better if you have one). Use a toothpick or fork to poke lots of holes throughout the crust to prevent bubbling. Bake for 6 minutes. Poke more holes in any places where you see bubbles forming. Bake for 3-7 more minutes, until golden brown. Check the TIPS ABOVE on working with fathead pizza dough! To make keto pizza once you have the crust, top with sauce and toppings after cooking the crust and return to the oven for about 10 minutes, until heated through. If you don't want to use the microwave, use a double boiler to melt the cheese and cream cheese together instead. Boil water in a saucepan, then place the cheeses in a metal bowl resting over the edges of the saucepan. The idea is to melt the cheese without burning it, stirring frequently. How to make fathead pizza with almond flour: Follow the instructions above, but replace the coconut flour with 3/4 cup almond flour and reduce the 2 eggs to 1 egg. Click or tap on the image below to play the video. It's the easiest way to learn how to make Fathead Pizza Crust! We loved this, thanks for sharing. What would the carbs be for the pizza base alone please? Thank you, Sare! The nutrition info above is for the crust only. This is my first attempt at a fathead dough. It went together with remarkable ease. I think my oven runs a bit hot, because I got it a little too brown. So next time I will adjust my oven temperature and add more sauce to the topping. I was afraid the sauce would make it soggy, but it is substantial and I should have loaded it up with more sauce and toppings. Definitely a keeper recipe. I made this today and it was absolutely delicious! It’s good and by far the best that I tried but can I add less mozzarella cheese and more almond flour? I’m not a fan of the cheese based crust. For me, it’s rubbery and gives me a greasey texture. (I use good top name brand mozzarella chees too). Hi Cheryl, I haven’t tried every possible ratio out there, I tested quite a lot and found one that many people like. If you don’t like a cheese based crust, you can try this almond flour pizza crust without any cheese. This pizza is delicious, everyone loved it! It was very easy to make. I added all of my favorite toppings. Someone recommended adding a little baking powder to the crust which I did. It made a very good, cheesey, buttery crust. I highly recommend this recipe. I should have posted a picture but now it’s too late all but one slice has been devoured by myself and my family lol! Will post a picture the next time I make it. Made this for dinner this week and my husband LOVED it. Thanks for such a simple and easy recipe! I was pretty skeptical about this recipe but it turned out surprisingly good. We made the almond flour version as opposed to the coconut flour one. Omg this is the best pizza hands down, I looked at some other comments and added some baking powder and garlic powder and it’s a hit. The crust rise and tastes amazing. Mamma Mia, I’m craving pizza on this Keto plan and thankfully I just found your site! I’ve watched this video several times and studying the questions/answers to make sure I do it all correctly, having never made dough before. You mentioned using a food processor to solve several issues but in your video you don’t use one nor did it look like much kneeding was necessary. Will I get the same results if I just follow your video or was there working the dough between fingers, etc. we didn’t actually see? Hi Caterina, It’s up to you if you want to use a food processor or not. When using your hands, it varies how much kneading is required – it’s really just enough to make it uniform, so the extra tips are just for achieving that. As long as it looks like the video you’re good. This recipe is TOTALLY AWESOME!!! 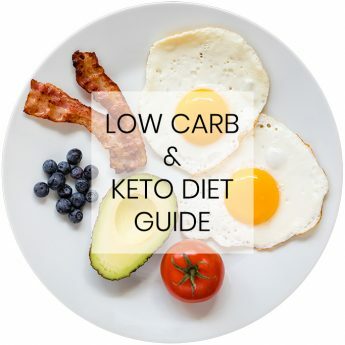 I am new to the whole Keto diet thing and I am missing things like pasta and pizza!!! A friend recommended that I try this, and OMG I was AMAZED! Not only did it look like pizza dough, it REALLY did taste like pizza dough!! Even my husband enjoyed it. I made mine with coconut flour and I was pleasantly surprised that it only had a hint of the coconut flavor! Finding this recipe is a Godsend and now I am anxious to try some pasta!! LOVE< LOVE, LOVE this recipe. Will never go back to wheat crust again!!!! There are not enough stars in the rating to rate this!!! This recipe is worth at least a 10 star rating!! Hi Robin, The nutrition info is for 1 slice, or 1/8 of the pizza crust. The actual number of servings would depend on how many slices you have and what you put on them. Can’t wait to try this read already that 1 slice of just the crust is 110 calories. So when you add toppings I guess it would be over 250. I am on low calories also. So will really have to plan to have this for dinner. Thank you. Will let you know what I think. I made the fathead pizza crust. Tasted great but had 2 issues. 1. The eggs never really blended into the dough. 2. Crust was not crispy. More rubbery. Any help for next time is appreciated. Hi Marti, I have some tips in the post above about ensuring that the eggs blend into the dough. Use either oiled hands to squeeze the dough through your fingers or use a food processor, but it does need to be uniform before baking. The texture issue you had is likely related to not blending the dough fully. This pizza crust was really good! I bake it until it is golden brown, then flip it and put sauces, cheese and toppings on the browned side. Back in the oven for about 10 minutes and it’s perfect! 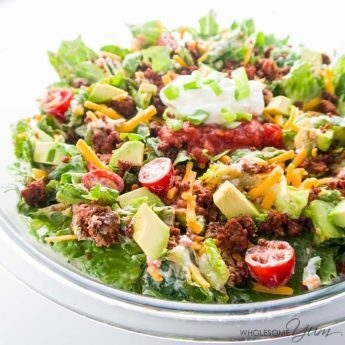 Thank you for this recipe, even non-keto family members like it!